ABUJA – The Federal High Court in Abuja on Wednesday asked the Federal government’s counsel to serve an “enrolled order” that would enable sureties to leader of the Indigenous People of Biafra, IPOB, Nnamdi Kanu, to produce him in court or to show cause why their bail bonds should not be forfeited. Trial Justice Binta Nyako made the ruling when counsel to one of the sureties, Chukwuma Maduchukwu Umeh, SAN, pointed out that his client, Immanu-El Shalom Ben Madu, was not served with official court papers relating to the order made by the court in its previous ruling, demanding that the Prosecution serves the sureties with copies of the order as made by the court. Also, in a joint application, lawyers to the three sureties argued that for the court to begin a forfeiture proceeding or issuance of bench warrant, it first requires serving an “enrolled order” to the sureties. “My Lord, I stand to align myself clearly, and without any equivocation whatsoever the submission made by the applicants. But I will like to put straight the point that section 36 of the constitution of the Federal Republic of Nigeria, requires that before any respondent be charged, a basis of fair hearing should be granted to that person. My client has never been served in any subject as regards to this matter,” Aloy Ejimakor, counsel to Senator Enyinnaya Abaribe stated. However, in his counter motion, the Prosecution counsel, Shuaibu Labaran, asked the court to discountenance the application of the sureties, arguing that they conspired to delay prompt proceedings in the matter. He said, “My Lord, may I start by saying that justice should not be sacrificed in the altar of illegality. This is leading me to the submission of counsel to the second applicant. He has been in this matter since 2017, portion of which the court has given categorical order requesting the applicants[the three sureties] to show cause, but filed an application before this Honourable Court, stating every details as to why the first applicant was not able to produce the first defendant which he took bail. “An unfair argument goes to the submission of the larger counsel to the third applicant. My Lord, he has made a presentation, in writing, before your Lordship. Similarly, on our side, we have also joined issues with him and for them to conspire, to draw a setback in this proceedings which is grossly unfair to this Honourable court and indeed the Prosecution. However, in her ruling, the presiding judge, Justice Nyako granted the request of the applicants(sureties) even as she noted that the application was an evidence of their lack of readiness to proceed with the matter. “Now I will tell you what I understand because this is the normal practice in this case. You are not ready, that is my understanding; because severally most of you have been here. I agree that maybe you have not been served an enrol order – it is possible. I have not gone through the parties to clarify that. If that is your complaint, it is okay. You have the right to be served with an enrol order. I shall make that order. “But the bottom-line is that you people are never ready. You never want this case to go on. You did not conspire, you only agreed amongst yourselves. You see, the important thing is this: once a case has been filed in court, one day or the other, it must be decided, either it is held and concluded or the merit is the case, or the prosecution will close it, or the Attorney General enters the body. “The sureties are to be served with the order of this court, to show why they should not forfeit their bond or to produce the defendant in the next adjourned date, with the alternative to be committed to prison,” she stated. 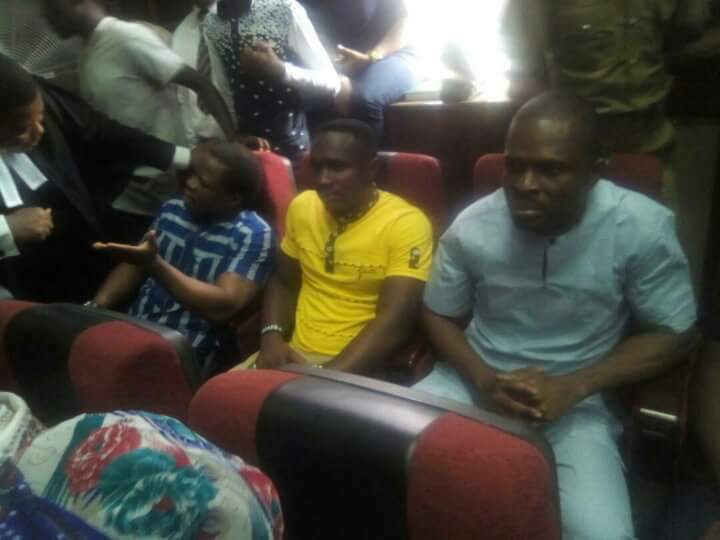 Consequently, the Court adjourned till June 26, 2018, to give time for the order to enable the sureties to appear in court to explain the whereabouts of the IPOB leader or forfeit their bail bonds. READ: Nnamdi Kanu and IPOB, The Best Thing That Happened To Middle Belt and Southern Nigeria. Meanwhile speaking to our Correspondent shortly after Wednesday’s proceedings, Kanu’s surety, Senator Enyinnaya who was present during the court’s proceeding, insisted he wasn’t served with the court order for summon but only learnt about it on newspapers. Speaking through his lawyer, Mr. Aloy Ejimakor, Sen. Abaribe said, “We’re here because we heard it over the newspaper but we were not issued any order.